We got out of our hotel at 7:00 am and got to Mt. Rushmore before 7:40am - we were one of the first dozen people in the park. Our accomplishment was partly due to the time, partly due to that fact that there had been severe thunderstorms that morning with continued light rain, and partly because there was some heavy fog or low lying clouds passing over the carved faces. We took the time to walk around the .6 mile President's Trail as the rain had finished and by the time we got back, the sun was coming out. We finished our visit to Mt. Rushmore with a visit, of course, to the Gift Shop. From Mt. Rushmore, we went down into Keystone where Lisa and I had planned an extra "surprise" for the kids. 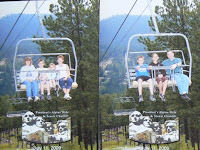 We took them to Rushmore Tramway (www.rushmorealpineslide.com) which has a ski lift to an adjacent hill, from which you get a unique perspective on Mt. Rushmore, and an Alpine slide back down. You sit in a little cart, controlling the speed of your own descent, and race down the mountain in a bobsled type track. It was a blast! 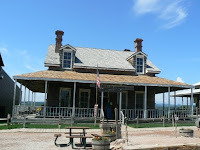 We then made an unplanned stop at Ft. Hayes - a tourist attraction just south of Rapid City. We stopped because it was FREE (that's me) and because they advertised that they had some of the props from "Dances with Wolves." What a surprise when we can across the Ft. Hayes command house used in the movies. We even got to stand on the spot Kevin Costner did when receiving his orders to go west. Leaving the Mt. 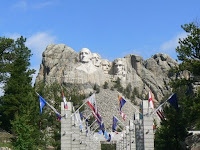 Rushmore area, we headed east on I-90 for our next destination - Wall Drug. 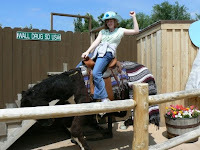 For those of you not familiar with it, it's kind of hard to explain Wall Drug. It's part souvenir store, part restaurant, part western museum, part playground, part everything. We had lunch there including a buffalo burger for everyone to share. 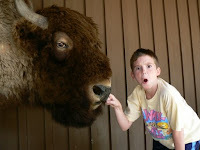 Having seen the buffalo a couple of days earlier, we didn't really enjoy it even though we thought it tasted okay! We then spent about an hour looking around the various stores that are a part of Wall Drug. Out back, Wall Drug has an area setup for families to take pictures of their kids in a variety of western situations. As always, Jariah is our clown and very photogenic! Everyone had a great time. We then drove the final 2 hours to our hotel for the night. Our Bible Hour today was Acts 1-8. Our in-car movie was National Treasure 1. We only drove 266 miles today. We've been swimming tonight and are looking forward to getting to Grandma and Grandpa Kroll's tomorrow afternoon (after visiting a Lewis & Clark exhibit, the Corn Palace and possibly a short trip into Minnesota).